Product #26602 | SKU ULW-16-HL | 0.0 (no ratings yet) Thanks for your rating! 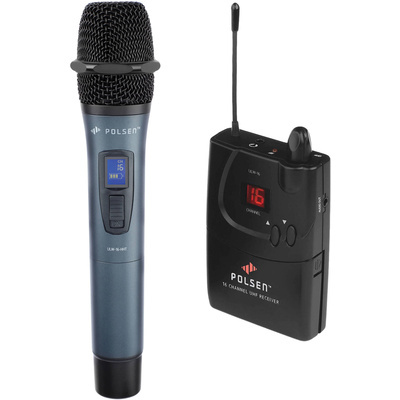 The ULW-16-HL from Polsen is a 16-channel UHF camera-mountable wireless system with a handheld microphone transmitter for capturing audio. It can be used in various environments for applications such as broadcast TV, live stage, ENG (electronic news gathering), public speaking, and more. It features an impressive 102 dB signal-to-noise ratio and can deliver pristine audio over a 100' distance with a simple to use interface. The ULW-16-HL receiver has other features such as LED indicators and LCD displays to visually monitor channels and RF signals. It is built with a headphone jack that has a separate volume control, which allows you to monitor the audio signal. This receiver is powered by two AA alkaline or rechargeable batteries and can be easily accessed from the front panel of the unit. It will run approximately 8 hours on a fully charged battery. The all-metal Polsen transmitter is built rugged and is designed to endure the rigours of the road. It features a dynamic handheld capsule with a cardioid polar pattern. The frequency response is 60 Hz to 18 kHz. The channel selector button makes it easy to switch between the unit's 16 selectable UHF channels. The dual-purpose integrated foam windscreen under the mic grille minimises vocal pops and wind noise, but also protects the mic capsule from moisture. The ULW-16-HL camera-mountable system comes with all accessories needed to get you operating, such as a 1/8" to XLRM line output cable, 1/8 to 1/8" cable for camera-level inputs, a shoe mount, four AA batteries, and a protective carrying case.